Note: As much as I wanted to keep this review completely spoiler-free, it is impossible for me to gloss over the discussion of an important turning point in the book. In order to avoid spoilers if you have not read this book yet, please skip the fourth paragraph. Alina Starkov grew up as one orphan in a household of many at Keramzin, her parents having died in the wars that have ravaged Ravka for well over a century. The orphans of Keramzin are educated and then conscripted into the King's First Army, leaving their childhood years a period of waiting and loneliness. Alina didn't think she'd be any different until Mal came; the two became fast friends, traversing the depths of boredom and existing as a pair amidst the sea of many. Alina and Mal's regiment are scheduled to cross the Unsea, a dangerous journey when even the most talented individuals are involved. Alina always thought that she would never be special, that she would be alone; she never could have known that confronting her fear of the darkened Fold would challenge both of those things and turn her world inside out. Within twenty pages of reading SHADOW AND BONE I knew that I was in for one of those rare all-nighters. I started this book and read and read and read and when I stopped it was 4.30 and, exhausted and full of fantastical places, I fell asleep to dream of Grisha wearing colorful kefta. I was pulled in immediately with the story of Alina as an orphan, hints at adventures with Mal, and the introduction of the mysterious Grisha and their leader, the Darkling. Though I was slightly taken aback when the time period shifted forward to her as a young adult, now conscripted in the First Army of Ravka, it only took a page or so for me to fall right into the older version of Alina and Mal. One of my favorite things about this story is how incredibly well developed the descriptions are; there was not a moment that didn't have some small element seamlessly weaving together a portrayal of a scene, whether it be for world building information or for what a character is wearing. As Grisha are one of the main themes in the book, the usage of color is inseparable from the narrative in order to separate the different specialties: Red, blue, purple, yellow, black, among others. SHADOW AND BONE would just be a story without the magical way Leigh was able to dip into the depths of Russian history to create a narrative that is nuanced, gripping, and incredibly compelling. Not a page went by where I couldn't perfectly envision the world that was playing out in word form before my eyes. The embroidered keftas, the sense of urgency in running, awe and excitement at new circumstances - they were all detailed in such a way as to put the reader directly into a cast of wonderfully developed characters. Alina was, without a doubt, my favorite of lot. Much of the story is about Alina's sense of self-discovery, but told in a way that seamlessly created a narrative around her journey. She's strong, thoughtful, and knows when to say no. Thought there are moments when she wavers, I believe they're done in a way that are completely relatable to human experience. As beautiful as the first part of the book was - and it was stunning - the pacing about one hundred pages from the end was the one thing that was able to remove me from the story and make me aware that I was an active reader and not living events through Alina's eyes. While a setup such as Alina had with the Darkling ("champion", distant trainer, love interest) is almost always too good to be true, the timeframe in which she is able to go from "the Darkling is not looking at me" to "he is a ruthless traitor" was unsettling. I never disagreed with her; I knew that she was right. But for all of the strong feelings that she had developed while at the Little Palace, that slight twist of belief changes the entire direction of the story. In her conversation with Baghra (and afterward), Alina reflects on certain moments and phrases that were breadcrumbs that eventually lead to shining light on what the Darkling was really after - all done in a compressed timeframe. While I fully believe those moments definitely allude to his foul play, her acceptance seems to be too much, too fast. Still, there's something about the play between darkness and light in this book that leads me to believe that all is not done between these two, and to say that I'm interested in seeing where Leigh takes things would kind of be an understatement. SHADOW AND BONE is one of the most beautifully constructed and compelling fantasies that I've read in quite some time. Everything about it hits just about every one of my interests: just the right amount of world building, characters that feel complete and nuanced, and a narrative that is able to tie all of these things together. If you have the opportunity, and a few hours block open on your schedule, I definitely suggest that you find a comfy, quiet spot and read it at your leisure. I absolutely cannot wait to read SIEGE AND STORM. 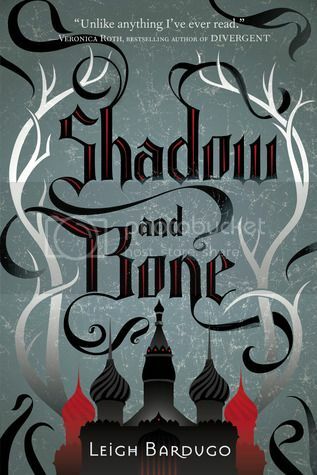 5 comments on "review: shadow and bone by leigh bardugo"
SHADOW AND BONE was one of my favs! I see what you mean about Alina's feelings to the Darkling changing suddenly, but at the same time, I was so sucked into the story, it didn't jar me that much. I don't think what happened between Alina and the Darkling is over yet either. Can't wait to see where Bardugo takes them next and what other parts of Russian history she uses for Ravka. I'm so glad you enjoyed it, Kaye! I was a a lovely surprise to me, too. The imagery was really strong and it should be interesting to see where S&S goes. I've heard nothing but good things about this one. I'm excited to get to it, but a little worried too. What if I don't like it? It sounds so beautiful. I hope I love it. @Christina: Christina, hi! It really was such a beautiful book full of history weaved with imagination; I could always perfectly imagine what was happening! I think I was perhaps just so deep into the story that I was thrown back by the change of perception, but I totally trust her with those characters to make it work. @Wendy: I can't believe it took me this long to read it - silly things like life being in the way, though I'm slightly glad because it's that much closer to the release of S&S! Definitely one of those books that sticks in your head. @Jenny: It's okay if you don't like it, or not all of it. I was iffy on that one part, but I believe that it will be pulled together in the next couple books. It's such a compelling read.